With rent hikes already slowing down and even more apartments set to open in 2018 and 2019, renters will gain more power to negotiate with landlords. Rents are dropping significantly across the Seattle area for the first time this decade, as a flood of new construction has left apartments sitting empty in Seattle’s hottest neighborhoods. The biggest rent decreases were mostly in the popular Seattle neighborhoods that are getting the most new apartments. Rents dipped more than 6 percent compared with the prior quarter in First Hill, downtown Seattle, Belltown, South Lake Union and Ballard, along with Redmond and the Sammamish/Issaquah area. Kim Malcolm of KUOW talks with Seattle Times reporter Mike Rosenberg about why rents have been declining in the Seattle area. Compared with a year earlier, rents still increased 4.5 percent regionwide, but that was the slowest year-over-year growth since 2011 and down from the double-digit increases that became common over the last few years. The slowdown comes as the number of new apartments opening across the area has hit record levels and has begun to significantly outpace the number of new renters. More apartments are sitting empty — particularly throughout downtown Seattle — giving renters more negotiating power over landlords. And even more new apartments are set to open in 2018, leading analysts to suggest the rental market will keep cooling. Renters have been waiting for relief for a long time. Rents across the region had soared 48 percent over the previous five years, adding an extra $550 a month to a typical renter’s bills. The Seattle area led the nation in rent hikes in 2016 and early 2017, according to Zillow. But now incomes are rising faster than rents, following a similar trend that had already taken place in other big cities over the prior few years. “Frankly, Seattle is the last of the really big markets to see this (cool-down) trend develop. It’s stayed at the top a lot longer than anywhere else,” said Greg Willett, chief economist for the rental data firm RealPage. He cited strong job and population growth as the reason Seattle surged for so long. That demand continues to be healthy, but now supply of new apartments is growing even faster. Willett predicts rent growth for the next few years will be about 3 percent a year, or similar to inflation, mirroring predictions from Zillow and other websites that track the local market. Developers and banks that lend money for new construction have taken notice of the market cooling. While tons of new buildings are already approved or under construction now, the pipeline for future projects that exist only on paper is shrinking. Greg Smith, CEO of developer Urban Visions, said he just turned down an offer to build a new high-rise because construction costs have risen so much and rents are no longer keeping pace. For renters, it’s still no picnic out there. But several renters who have been looking for apartments recently said they’ve noticed things at least weren’t as bad as they used to be. Katie Zacharkiw said she just signed a new lease Wednesday, and got the first apartment she looked at. “I ended up at a one-bedroom in Wallingford for $1,400 month, which I’m still a bit shocked about,” she said, noting she expected to pay $1,500. Grant Slemp and his wife moved from Redmond to one of the new South Lake Union buildings last month. “Prices were a little lower than I was expecting, which was nice,” he said. Still, they were delayed when the first unit they looked at was rented out by someone else before they could put in an application. Seattle remains among the most expensive places in the country to rent. The average rent across all unit types is $2,330 in downtown Seattle, $2,180 in West Bellevue, $2,120 in South Lake Union and $2,050 in Belltown, according to Apartment Insights/RealData. 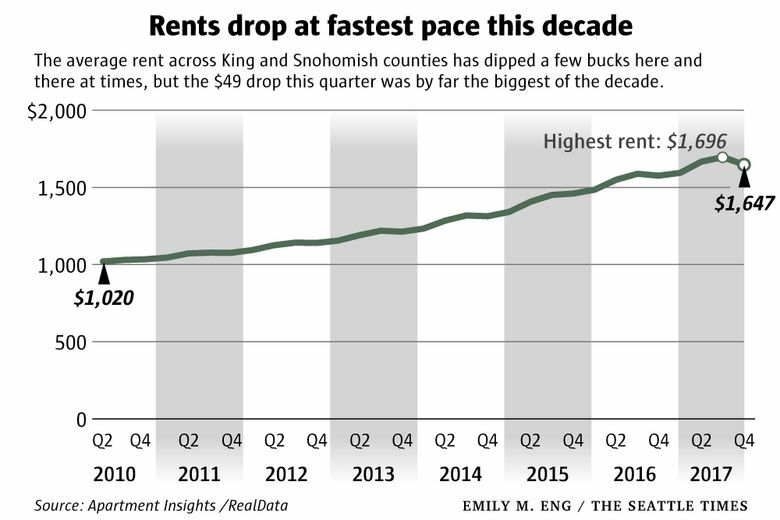 On the other end, rents remain below $1,300 in SeaTac, Des Moines and Tukwila, and below $1,500 in most of Snohomish County. The vacancy rate across the region grew 0.8 percentage points to 5.4 percent in December — the highest since 2010 — a sign that supply has outgained demand. In South Lake Union, where developers have been gung-ho about Amazon’s rapid growth, so many new apartments have opened up in recent years that the vacancy rate increased from 4.6 percent to 7.1 percent (the figure excludes brand-new buildings just starting to lease up). That’s a huge jump that gives the neighborhood the second-highest vacancy rate in the region, behind the Everett/Mukilteo area. For more than a decade, The Seattle Times, other media organizations and official sources like city governments have relied on two competing landlord survey groups for information on the local rental market: Apartment Insights Washington, and Dupre + Scott. The Times has cited those firms’ data in more than 100 stories in the past 10 years. They periodically survey virtually all local rental-property owners to produce more accurate and thorough statistics than websites that rely on algorithms and online listings to gather stats like average rents. Last fall, Apartment Insights Washington owner Tom Cain said he was selling to business partners in Phoenix that put out similar reports in other markets. In December, Mike Scott and Patty Dupre announced they were retiring and closing Dupre + Scott for good. The new Apartment Insights owners plan to put out quarterly reports updating the data Cain has long released, starting with the fourth- quarter statistics used in this story. They are switching to the brand name of Apartment Insights/RealData, but there are no methodology changes. Information from Dupre + Scott will no longer be available. Among the brand-new buildings in South Lake Union, about one-third of apartments are sitting empty. And in the core of downtown, about two-thirds of newly opened apartments are vacant. 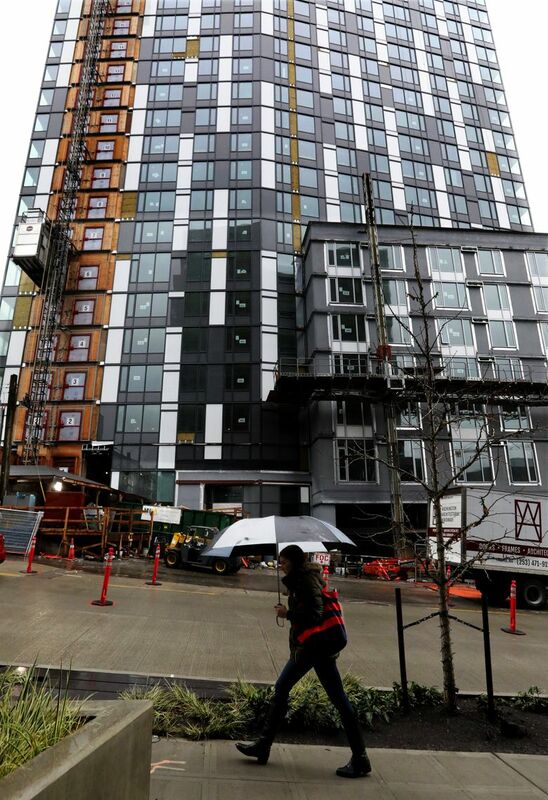 The flood of open apartments in South Lake Union suggests many of the thousands of new workers filing into Amazon’s campus each year are choosing to live in other neighborhoods. Overall, there are 24,500 apartments under construction now across King and Snohomish counties. There are an additional 35,000 units in the pipeline, although not all of those will get built. The city of Seattle is getting more apartments this decade than in the prior 50 years combined. For the Puget Sound region as a whole, the current construction frenzy rivals the record apartment boom from the late 1980s, which was centered in the suburbs. A separate Apartment Insights/RealData report found the average rent across Pierce, Kitsap and Thurston counties was just under $1,200 per unit in the fourth quarter. Rents in those areas were up slightly from the previous quarter and grew 7.8 percent from the previous year, indicating the South Sound rental market is now significantly hotter than King County, even as it remains a much more affordable option. The rental slowdown runs counter to the for-sale housing market, where home prices continue to shoot up unabated at the fastest rate in the country. A key difference is that there are very few new single-family homes being built in the region, in contrast to the frenzy of apartment construction.